Last week, music nerd that I am, I put in an order on Amazon for a book by Paul Hume, who was the former music critic of the Washington Post. I am a fan of Paul Hume because he was a fan of Leonard Pennario. He wrote the liner notes to a Schumann album that Leonard recorded in the 1950s. Paul Hume is also legendary for giving a bad review to Margaret Truman, the daughter of then-President Harry S Truman. President Truman wrote him a letter to the effect of he was going to punch Hume out. That was back when people could write things like that. Hume later sold the letter for a whole pile of money. And as I understand it, he and Truman smoothed things over. This book by Paul Hume that I ordered was entitled, "Catholic Church Music." It is out of print and looking at used copies on Amazon, I sprang an extra buck for one that had a stamp of a convent on the inside. Sure enough, it says: "St. Joseph Convent Music Dept." But here is something else. The book arrived with a holy card mysteriously packed with it! The card is to "Our Lady Of Good Remedy." Who has ever heard of that? Not I. The back of the card explained it, that 800 years ago, Christians were being enslaved, and in 1198, St. John of Matha founded the Trinitarians to go to the slave markets, buy the Christian slaves and set them free. The card continues: "To carry out that plan, the Trinitarians needed large amounts of money. So they held 1,000 bake sales..." Oh wait. I love bake sales and always consider them the answer to everything so I was imagining that last part. What the card actually said was, they placed their fund-raising efforts under the patronage of Mary. They succeeded! Hence St. John of Matha honored Mary with the title of "Our Lady of Good Remedy." 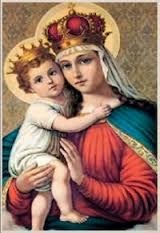 It goes on: "Devotion to Mary under this ancient title is widely known in Europe and Latin America, and the Church celebrates her feast day on Oct. 8." Did the sender place the holy card with the book banking that it would arrive just in time? Or is this just coincidence? Why did the sender place a holy card with this book to begin with? I did not order one. Did the book come from the convent itself? Whatever, it is perfectly timed for October, the month of the supernatural. 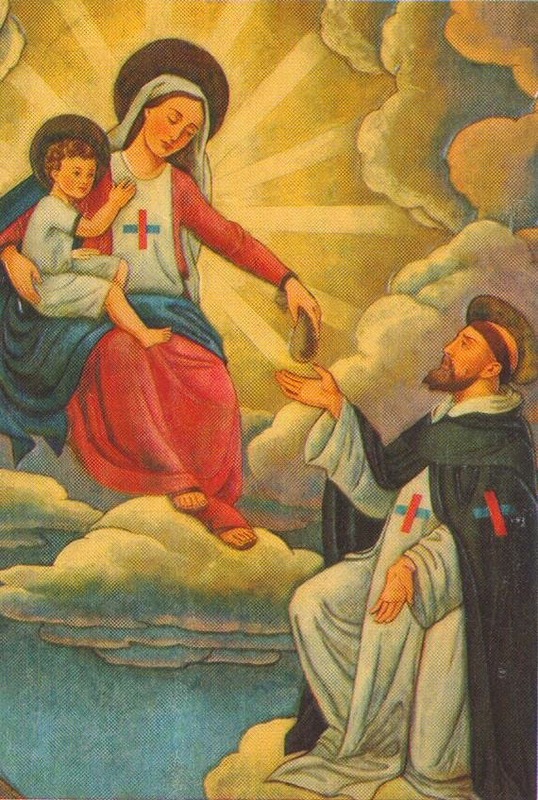 The card says: "Our Lady of Good Remedy is often depicted as the Virgin Mary handing a bag of money to St. John of Matha." ... but it looks disappointingly modern. Our Lady of Good Remedy ... Pray for us! Pray for me, anyway. I need a good remedy, now and then!